Here’s some more from AltadenaAboveitAll’s outing. That’s what my pals Bob Reid and Greg Downs who live on Canyon Crest said this morning as the water in the arroyo let loose, topping the sides of the banks and propelling rocks and boulders down the canyon. 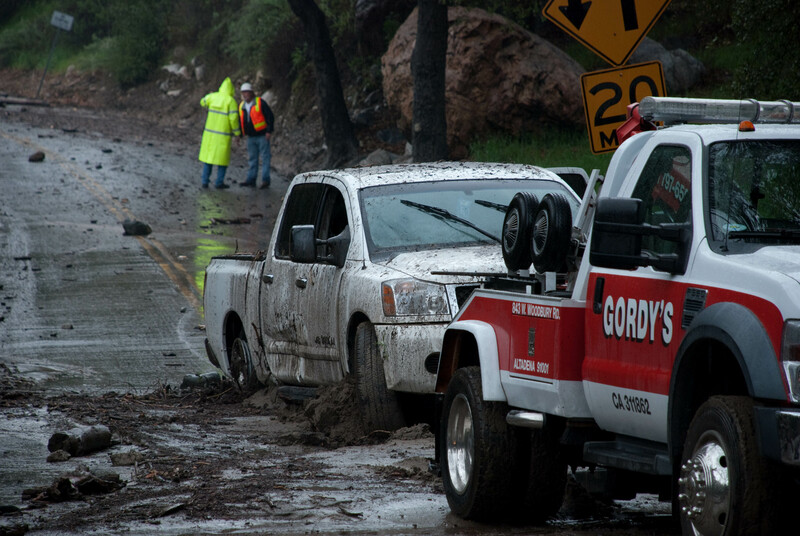 Caught in the mudflow was Rueben Ruiz and Brandon Leon and his dad, each in different trucks. Ruiz, heading down the canyon, suffered the worst. His truck completely spinned sideways, into the Leon’s truck, mud covering his roof. Ruiz had to climb out of the passenger window, getting covered in mud himself. Take a look at the pix. What a mess. Even Univision TV showed up to document the event.